"I was close to my house at around 9pm when I met a group of soldiers who ordered me to lie down," he said while fighting off tears. "They said I was part of a group that was insulting them during the afternoon. "I tried to plead my innocence, but they were not interested in what I was saying and they started hitting me on the head. I screamed for help, but the moment I did that, they intensified the beatings. "I tried to flee, but I met another group of soldiers who started assaulting me again. The ones who beat me first caught up with me and joined in the assault. I couldn't do anything." "I didn't participate in anything that they were accusing me of," he added. "Now my life is miserable and I cannot work for my two wives and three children. "I am always in pain and ‘see' the soldiers coming for me. They said they would come back for me and I always have visions of them even when I am sleeping. I have no peace at all." One of Mutoko's wives said they feared he was losing his mind due to the savage attack. "How could soldiers be moving around and assaulting anyone that they meet? I think they must take responsibility for this problem that we have," she said. "They must at least pay for his medication." 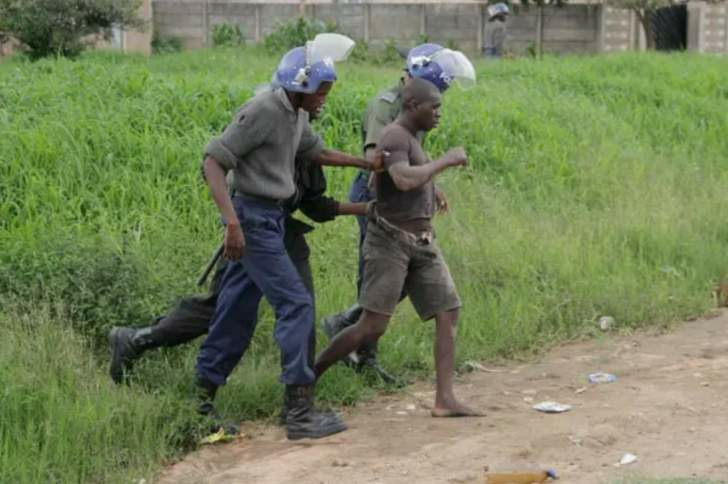 President Emmerson Mnangagwa's government has repeatedly denied that soldiers were behind the violations, but the president promised to bring the perpetrators to book after Britain's Sky TV recorded two police officers and a soldier brutalising a suspect during the protests. "The violations are systematic, unleashed mainly by male perpetrators whom the victims identified as wearing either military or police attire, armed with AK rifles and or baton sticks, travelling in army and police vehicles," the report says. "The targets of attack were initially the male population in highdensity suburbs, but later became indiscriminate to include women and young girls." "The Forum calls upon the state media that is funded by the taxpayer, to stop its current propaganda that is fuelling state violence and fanning hostilities in violation of the founding values of the constitution of Zimbabwe and the values of peace journalism," the report added. "The state media must do its work responsibly in service of the nation and not be used in pursuit of a partisan parochial political agenda." Human Rights Watch' southern African director Dewa Mavhinga said Mnangagwa's government must investigate the cases involving the army and ensure justice for the victims. "All cases of people with physical and psychological injuries from the security forces crackdown on the January protests must be treated with utmost urgency by the government," he said. "President Mnangagwa should, through the minister of Health, issue an open public invitation from all such people to go to the nearest hospital or clinic for urgent medical support on the government's account. "A government that cares about its citizens will not look aside in the face of such a catastrophe, it steps in to help."